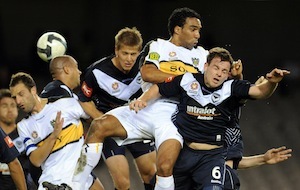 Melbourne Victory and Wellington Phoenix players in action during their round 6 match, played at the Ethihad stadium in Melbourne, Sunday, Sept 13, 2009. AAP Image/Joe Castro. The Wellington Phoenix are kicking and screaming for their very existence, and doing a damn good job of it. A sell-out crowd of 32,792 watched them defeat Newcastle 3-1 in extra-time to book their place in the preliminary final against Sydney FC for the right to face Melbourne Victory in the Grand Final. It was an enthralling end-to-end display at the Westpac Stadium as Wellington’s dream run, and that of New Zealand football’s as a whole, continued with Paul Ifill’s extra-time strike and Eugene Dadi’s sealer killing-off the stubborn Jets. The Jets took a surprising lead when Matt Thompson took advantage of some lacklustre defending, only for Tim Brown to even proceedings before halftime. Ifill was once again instrumental in Wellington’s attacking dominance, finally hitting the back of the net in extra-time to the rapture of the locals. The major semi-final, meanwhile, produced another intense match between Australia’s two biggest clubs with a 4-3 aggregate win to the Victory. (Speaking of aggregates, if the A-League is going to continue with aggregated two-legged finals, it needs Fox Sports to get with the program and show the aggregate scores in their graphics). The win gives the Victorian capital the honour of hosting the Grand Final for the third time in the last four seasons. The intensity and excitement of the matches has revitalised the finals series, which had been questioned by some, including me, following the growth in stature and excitement of the Premiership race. It was a great day for the A-League, with both matches living up to their billing. But the story of the day was undoubtedly Wellington. The political upheaval that has clouded the future of the club has helped fuel the ‘Nix’s recent momentum, and credit to all those at the club and in the stands who are putting such a strong case for their future. And if the AFC hasn’t opened its eyes as yet to what New Zealand football could offer the Asian confederation, let alone how important they are to the A-League, then they need to wakeup. It’s an important milestone for New Zealand football; the first time a team from across the Tasman has progressed so far. New Zealand franchises have often been perceived as the weaklings of the A-League – allowed in the league as a parting gift to Oceania, helping to makeup the numbers. But few could have predicted the all-encompassing growth, at international and club levels, of the sport in New Zealand following World Cup qualification, especially the form of the Phoenix, who many thought were destined for the wooden spoon following the loss of Shane Smeltz. The country has been galvanised by the Phoenix, as evidenced by the 20,000 plus crowd Wellington pulled in Christchurch when Adelaide United visited in Round 25. One can only imagine what a good performance at the World Cup (a win against Italy would be nice) would do for the Phoenix heading into next season, let alone championship success! For the sake of the A-League, and commonsense, they need to be granted amnesty and a 10-year licence. A-League fans, meanwhile, have said all year that a Melbourne Victory and Sydney FC Grand Final would be the best outcome in terms of the spectacle and crowds. However, with the pair having battled out for the Premiership Plate (minor premiership, for the uninitiated) already, a trans-Tasman Grand Final wouldn’t be a bad option – the pride of New Zealand against Australia’s best. It would be a wonderful touch in a year in which Australia and New Zealand will be heading to the World Cup finals together for the first time and the rivalry between the Socceroos and All Whites will be rejuvenated at the MCG farewell match in May. And just think of the irony if Wellington were to go on and win the A-League championship and ‘qualify’ for the Asian Champions League. They would, unfortunately, be forced to hand that ACL spot to the Melbourne Victory, even if they beat the Victory in the Grand Final. Unjust? Absolutely, but that’s what would happen thanks to the peculiarity of their unique situation. Even though the Phoenix would be allowed in by the AFC in 2011 (albeit as an Australian entry with the limit of the ‘three foreigners rule’), it couldn’t enter the ACL under its agreement with the FFA, according to SBS’s The World Game website. If Wellington’s continued success helps strengthen their case for survival, then it’s even more reason to jump on the Phoenix bandwagon in the coming fortnight and watch the trans-Tasman rivalry grow at the domestic level.